Chelsea Lane at 1680 East 6th Avenue first opened in 1993. This 3-storey, wood-frame townhouse complex has a good range of amenities and is just steps away from the thriving urban community of Commercial Drive that includes small parks and a range of small businesses and cafes. 27 one-bedroom seniors’ suites with balconies or patios. 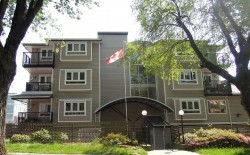 2 wheelchair-accessible suites for disabled residents. Community room with kitchenette and coin-operated laundry.